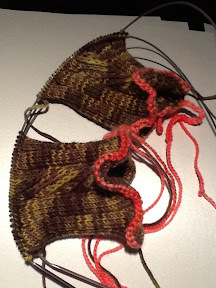 amour-fou-socks: On on to the next pair! I purchased this yarn from Morris & Sonswhilst roaming around the city in Melbourne. It's a really good yarn shop with good quality yarns and lots of variety. The yarn is one of their own line called Empire which is a 4ply 100% Australian Merino super wash. The colour is a variegated and called Acadia. It's lovely to knit - soft to the touch! I'm stepping up to the challenge of cuff down socks and have used a crocheted chain as a temporary cast on. I prefer the toe up as it is easier to make them the right length in the foot without the risk of running out of yarn before finishing the cuff. Hence "the challenge" of getting it right!